Many developers aspire to ‘NES Hard’ – that familiar brutality that many grew up with. A Hole New World definitely falls into that category, but with the added twist of having to play some segments upside-down. Demons and monsters have invaded from the underworld, leaving holes everywhere that lead down into the flipped version of the world below. While this takes away the tiresome trick of having lethal pits everywhere, it just means the developers can throw you into difficult situations where you have to get your bearings on top of dealing with everything else being thrown at you. A Hole New World has players controlling the Potion Master, a bottle-chucking, cloak-wearing figure, across five different stages. This agitated apothecary attacks using hurled potions, meaning you’ll need to get used to lining up your throwing arc with your enemies if you want to hit anything. Weapons with throwing arcs can make for irritating play, but the developers haven’t just left you with such an annoying weapon. 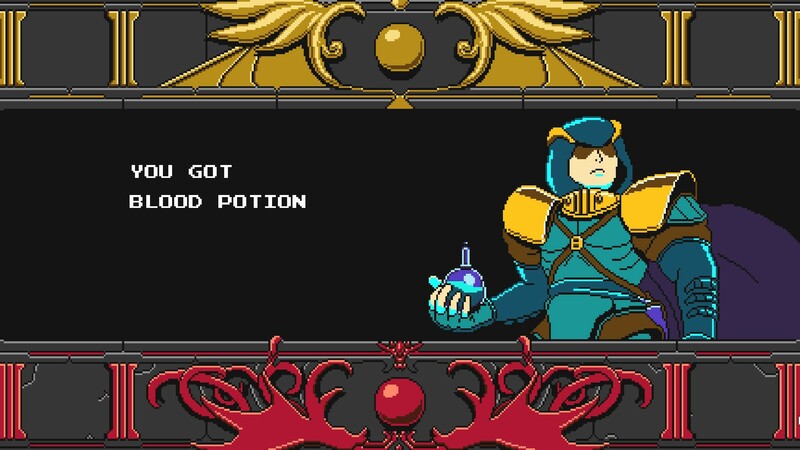 You will also get other potions as you beat bosses that will create a long vertical blast, send balls of fire and ice bouncing around a room, or hurl swirling balls of blood straight ahead at foes. Players can also use a charged beam from a fairy companion, giving players a robust arsenal as they play through the game. These weapons are unlocked by beating the game’s bosses, with the level following often designed to take advantage of the new weapon’s properties, encouraging players to really get used to them. This is a handy idea, as by the end of the game, each will offer handy ways of dealing with the creatures and situations they’ll come across over the course of play. You will want to be very familiar with your weapons, as many of A Hole New World’s enemies are tough. They take a lot of hits to put down, forcing players to linger on a given screen to deal with each foes carefully. There’s no running through and blasting things, as the enemies take just enough hits that you often need to stop to deal with them. That doesn’t sound like a huge development, but A Hole New World’s developers like to put you in challenging situations where moving on would definitely make your life easier. There are often three or four foes on-screen in many places (especially late-game), many with defenses like shields or hard shells that require they be attacked in specific ways. You’ll be juggling all of their varied attacks, dodging and leaping around them while trying to return fire, and all you’ll want to do is just scroll that screen to get rid of one, or at least have one die to take some pressure off. Moving on often means taking a hit, though, and you have precious little health to waste. Because the enemies take so much damage, it means you have to know your abilities, your enemy’s attacks, and the game well if you mean to get far. There are few moments you’ll breeze through. Now, this would be hard enough for most games, but A Hole New World goes a bit further by having you play upside-down. 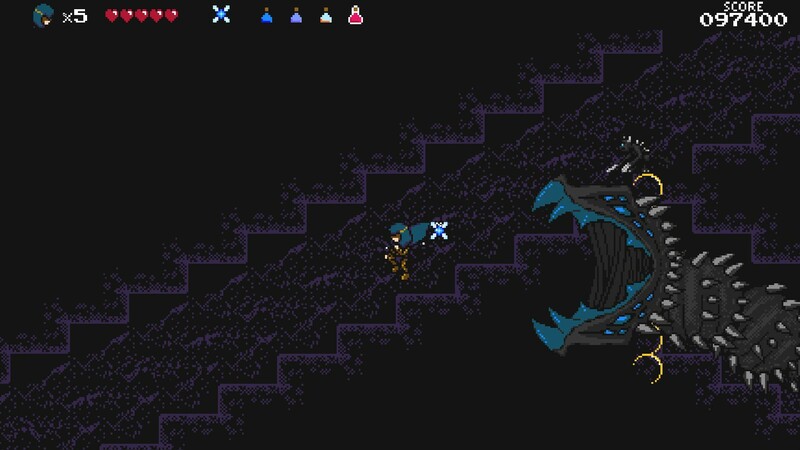 If you fall into a pit (and you often have to in order to continue progressing), you’ll end up in the Underworld, playing with the screen flipped so that you’re standing on the ceiling. Players will then have to juggle these new controls and this new perspective on top of doing everything else. The game doesn’t go easier on players in this situation either, so you really, really need to know the weapons and systems well to deal with these parts. And if that’s not enough, often the stages have some sort of unique mechanic in place. Maybe giant worms are digging holes in walls and floors and you have to watch out for them or follow them down the paths they make. Maybe deep snow makes jumping difficult. Maybe some foes can only be damaged if you light torches in the middle of the run. You have to keep up with a ton of stuff, so even if you think this will be a short game with its five levels, those five levels pack in a great deal of challenge. The developers aren’t entirely merciless, though. You can take five hits per life, and outside of bosses, you will revive right where you died when you run out of health. This is just enough help that someone with average skills can eventually make it through the first couple of stages, but by the end, you need to be much more careful. The game also features a checkpoint system, breaking each stage into chunks, and you can continue as many times as you like, making for an experience most could complete if they really push themselves. However, better endings await players who manage to complete the game without having to use many (or any) continues. If five stages don’t sound like much to you, each offers a sprawling map, with various routes you can take throughout them. Each is also filled with gemstones, each of which offers points (which give you more lives) as well as goes toward new endings. There are also NPCs hiding in each stage that you can free, adding more stuff for players to look for when they start to get better at the game. If that still doesn’t sound like enough, the game has several different challenge modes, New Game +, and Boss Rushes to keep you busy with it. A Hole New World has a lot to offer players who love the old, hard, pixelated games of their past. It’s an already-challenging game with its enemies and stage designs, but adding in the trick of playing upside-down takes the difficulty and cranks it up. Even so, it’s generous enough with its lives and checkpoints that it rarely feels completely unfair, creating a balanced, enjoyable experience. If you’re looking for a new kind of difficulty, it’s well worth picking up.